or buy the individual iPad editions through iTunes. 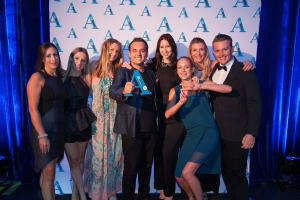 Group sales and marketing director at Nine Entertainment, Peter Wiltshire, said: "The AdNews Agency of the Year Awards are an important fixture of our industry, a night where we celebrate our success and congratulate the talented people that make our industry as incredible as it is. "We've been part of the AdNews Agency of the Year Awards for the last nine years, and the major sponsor for the last four. Nine Entertainment Co congratulations all the finalists and winners from last night. We hope you all had a great night." Nine Enertainment Co. was the major sponsor of the Agency of the Year Awards. Supporting sponsors are: Adstream, Facebook, Gumtree, IAB, IPSOS, Smooth FM, Think TV, Val Morgan. Associate sponsors inlcude Royal Auto and Bluestar. Our Red Carpet sponsor is Bauer Media. It's a hat-trick win for Leo Burnett Sydney, which this year has been named the AdNews Agency of the Year, as well as topping the Ad Network of the Year and NSW Agency of the Year categories. The competition for the Agency of the Year was particularly fierce between finalists Mnet, Soap and Cummins&Partners, but Leo's swiped it for demonstrating that a traditional shop can change the game. The firm's NSW division also picks up NSW Agency of the Year. Clearly not content to rest on its laurels. Leo's NSW made waves after becoming the sole agency on record for Diageo by winning full service media, digital PR and experiential business for the brand – a first for the creative agency taking on media. Leo's also fended off stiff competition in the Ad Network of the Year category, owing partly to its appointment as the lead agency for Woolworths Retail and Supermarkets and its hiring as the through-the-line agency for Honda – two big wins in a year which also saw it pick up SPC Ardmona, Bonds, Unibet, Pfizer, Golden Valley and Victoria University. 'Media Network of the Year', meanwhile, goes to UM NSW for a second year in a row. AdNews judges were impressed with the way the company handled a changing 2014 with a redesign of structure, services and business models, to win some serious new clients – Coca-Cola, Santos and Tourism and Events Queensland. Elsewhere on the list, The Brand Agency WA has come back from a tough 2014 to pick up the State Agency of the Year award, while Cummins&Partners, which was responsible for the one of the most heart-warming campaigns this year on behalf of CGU Insurance, wins the 'Victorian Agency of the Year' category. In the work categories, Saatchi & Saatchi's 'Penny and the Pirate' work for Luxottica Australia has delivered wins in both the Game Changer and Digital Campaign categories, while DDB Melbourne's 'Radiant Returns' for Radiant is also a double winner, picking up both 'Ad Campaign of the year' and the 'Branded Content award'. This year's Hall of Fame inductee is Scott Whybin. The full run down of the winners and finalists is in today's print issue of AdNews along with a profile interview with Whybin. You can subscribe in print here or buy the individual iPad editions through iTunes.